Stephen Rowan was Captain of the steamship Pawnee in 1861. 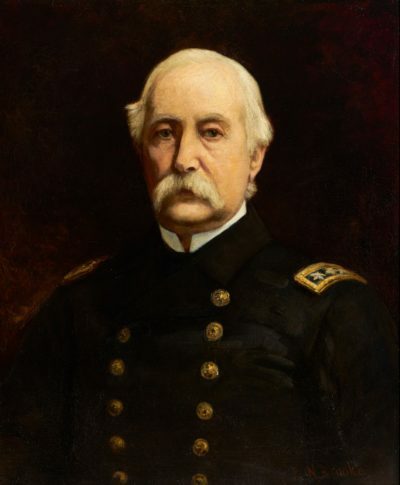 During the Civil War, he attempted to relieve Fort Sumter and later assisted in the capture of forts at Hatteras Inlet. Rowan assumed command of Federal forces in the North Carolina sounds in 1864. He then served as Commandant of the Norfolk Navy Yard until he assumed command of the Asiatic Squadron in 1867. Rowan also served as Commandant the New York Navy Yard (1872-1876) and as Superintendent of the Naval Observatory in Washington, DC (1882-1889), whose grounds today include the residence of the Vice President of the United States. His 63-year career was one of the longest in the history of the U.S. Navy.